Sinn Féin TD for Wicklow John Brady has called on Minister Harris to honour his commitment to the people of North Wicklow and establish a GP Out-of-Hours Service. 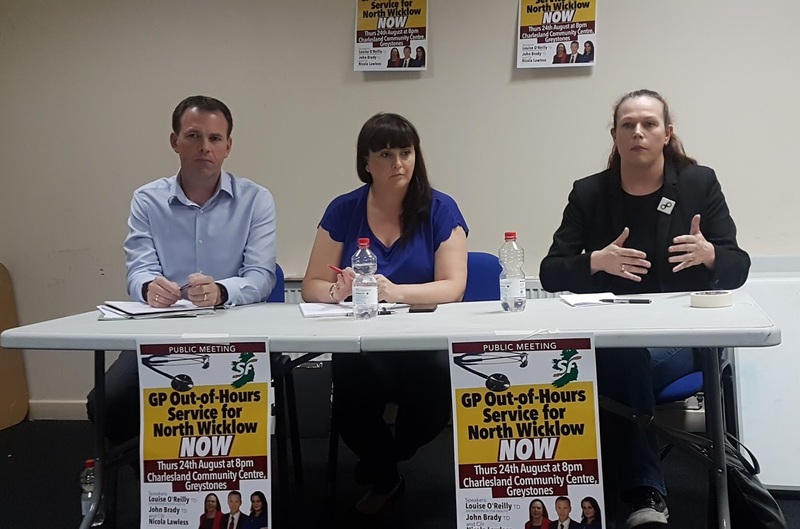 The public meeting was held on Thursday evening in Greystones and heard from Sinn Féin spokesperson for Health Louise O’Reilly TD and Sinn Féin Councillor for the Greystones Municipal District Nicola Lawless. “The people of North Wicklow are sending a clear message to Minister Harris, they want him to honour the commitment he made to them regarding a GP Out-of-Hours Service which was promised to be up and running six months ago. “It is not good enough for Minister Harris to simply say the funds are not available from the HSE. This excuse does not wash with the people here. “When we look around at the current state of the hospital crisis, it is more important than ever that people can access health services locally in their communities. If we want to tackle overcrowding in our A&Es and hospitals, there has to be adequate access to care in communities first and foremost.